Far-fetched? Hardly. Welcome to the good ol’ US of A. An estimated 1% of the area of the lower 48 states is covered with impervious surfaces. That’s more than 32,000 square miles – the size of South Carolina or Austria. About 25% of that area – approximately 5.2 million acres – is comprised of parking lots, just slightly less than the area taken up by roads and by buildings, 28% and 29% respectively. Most of those parking lots, as well as many driveways, are paved with asphalt. It is exceedingly common for asphalt-paved parking lots and driveways to be “sealed” to make them more impervious and hence last longer (interestingly, roads paved with asphalt are only rarely sealed). The sealant of choice in most of the U.S. is made with coal tar pitch (in the Western U.S., asphalt-based sealants are typically used). One estimate suggests some 85 million gallons of coal tar-based sealants are sold each year in the U.S. So what’s not to like about coal tar and coal tar pitch? Coal tar pitch is the residue left over from distillation of coal tar, which is in turn a by-product of the process used to transform coal into coke for use in making steel. Both coal tar and coal tar pitch are produced in huge volumes every year in the U.S. According to the most recent EPA data, more than one billion pounds of coal tar were produced in 2005, and from that material more than 500 million pounds of coal tar pitch were derived. Coal tar and coal tar pitch have both been shown to cause cancer in people, including cancers of the skin, scrotum, lung, bladder and renal pelvis and possibly leukemia as well. The likely culprit? Polycyclic aromatic hydrocarbons (PAHs), a complex mix of individual chemicals many of which have been linked to a whole range of cancers. Coal tar pitch is comprised of 50 percent or more of PAHs, and coal tar-based sealants typically are 20 to 35 percent coal-tar pitch. That amounts to a lot of carcinogens being spread around willy-nilly. PAHs are also linked to a broad array of environmental impacts. Among other effects, some PAHs are toxic, carcinogenic, mutagenic or teratogenic (i.e., cause birth defects) to aquatic life. But who licks their driveway? Now, many of you are probably still saying, what’s the big deal? No one’s going to be exposed to stuff spread on parking lots, right? Enter the real heroes of this story: researchers at the National Water-Quality Assessment (NAWQA) Program of the U.S. Geological Survey. In monitoring urban lakes and streams, the researchers began noticing elevated levels of PAHs; core samples of sediments taken from urban lakes across the country showed that the increases began in the 1960s and coincided with regions having increased use of coal tar-derived sealants. Now, PAHs come from a host of sources. In addition to their presence in coal tar, they’re a product of incomplete combustion generated by sources such as motor vehicles, wood fires and smoking cigarettes. But each source of PAHs has its own “fingerprint,” and the USGS researchers were able to show that the predominant source of PAHs in the urban lakes was coal tar-based sealants. Remember I said that a different type of sealant derived from asphalt is used in the Western U.S.? Now look again at the map above – striking, no? 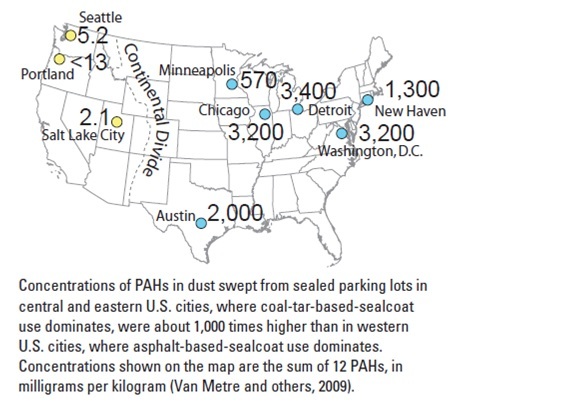 Coal-tar-based sealants (used in cities shown in blue) contain about 1,000 times more PAHs than do sealants with an asphalt base (used in cities shown in yellow). Studies of surface runoff from sealed and unsealed asphalt parking lots are equally striking. PAH levels are ten-fold higher in runoff from asphalt-sealed lots than from unsealed lots – and 65 times higher from lots treated with coal tar-based sealants. Scientific studies have shown a relation between coal-tar-based pavement sealcoat and harmful effects on aquatic life. Aquatic communities downstream from stormwater runoff from sealcoated parking lots were impaired (Scoggins and others, 2007). Salamanders and newts exposed to sediment contaminated with coal-tar-based sealcoat had stunted growth, difficulty swimming or righting themselves, and liver problems (Bommarito and others, 2010a, b). Frogs exposed to sediment contaminated with coal-tar-based sealcoat died, had stunted growth, or developed more slowly than usual (Bryer and others, 2006). OK, so maybe a few aquatic critters are getting dosed, still no big deal, you say? Over the last decade or two, lowly house dust has emerged as an important source of exposure to many chemicals, including to carcinogenic PAHs. And kids especially are vulnerable to such exposures, because they spend a lot of time on the floor and are notorious for constantly putting everything, including their hands, into their mouths. That’s what led the USGS researchers to look for PAHs in house dust from apartments as well as in dust from the parking lots adjacent to the apartments. They found that the house dust in apartments near parking lots sealed with coal tar-based sealants had PAH concentrations that averaged 25 times higher than the concentrations in house dust from apartments with parking lots that had other types of surfaces: concrete, unsealed asphalt or lots treated with asphalt-based sealants. The most likely route by which the PAHs get into the house? Simple: The soles of shoes on people walking across the lot from their cars into their apartments. Human health risk from environmental contaminants usually is evaluated in terms of exposure pathways. For example, people could potentially be exposed to PAHs in sealcoat through ingestion of abraded particles from driveways, parking lots, or play grounds, or through skin contact with the abraded particles, either directly or by touching toys or other objects that have been in contact with the pavement. Inhalation of wind-blown particles and of fumes that volatilize from sealed parking lots are other possible pathways. PAHs in streams and lakes rarely pose a human health risk from contact recreation or drinking water because of their tendency to attach to sediment rather than to dissolve in water. As to that last sentence, by the way, I would hasten to add that it is limited to direct human exposure. PAHs are notoriously bioaccumulative, and can build up in the food chain (including in sediment-dwelling or bottom-feeding aquatic animals) – ultimately reaching people through an indirect, but potentially even more significant, pathway. I was spurred to research and write this post by the adoption of a law in Washington State earlier this month that bans the use of coal tar-based sealants. That makes Washington the first state to do so – a bit ironic, when you look at that map I included earlier in this post. A number of other cities and counties have done so as well: Austin, Texas, Washington, D.C., Dane County, Wisconsin, and several suburbs of Minneapolis, Minnesota. Other bans are being considered. USGS researchers continue doing their part to raise awareness of this widespread problem, including via a congressional briefing held last month. Coal tar and coal tar pitch have long been known to contain high concentrations of PAHs. PAHs have long been suspected or known to contain highly toxic and carcinogenic substances. So why did it take so long for anyone to question the wisdom of spreading millions of gallons of the stuff onto millions of acres of surfaces directly exposed to the elements? And why should we be surprised that such a toxic goo isn’t staying put but is instead finding its way into our environment, our homes and our bodies? This national problem demands a national solution. It serves as yet another compelling illustration of the utter failure of our current chemicals policies, which – as I noted at the outset of this post – have indeed allowed the unthinkable: the spreading a human carcinogen across millions of acres of this nation’s land. Thanks to Joni Mitchell, parking lots are often used as a symbol of our loss of nature, but they’re a reality unlikely to change any time soon. But toxic parking lots?? That we ought to be able to do something about. This entry was posted in Emerging Science, Health Science and tagged carcinogen, Carcinogenic Mutagenic or Toxic for Reproduction (CMR), children's safety, contamination, inhalation, polycyclic aromatic hydrocarbons (PAH). Bookmark the permalink. Both comments and trackbacks are currently closed. Fantastic post. Thank you, Richard. I’ll do my part to circulate this to everyone I know (and don’t know) and hope all readers do the same to get the word out. Very important information–and a problem we can solve. Funny how a bit of old-fashioned advice could go a long way towards maintaining household hygiene–no outdoor shoes worn indoors….! This is remarkably informative. I am an exercise physiologist who works in a physical therapy clinic specializing in cancer and parkinson’s rehabilitation. I have also taken on the role of researching the impacts of environmental toxicity in the incidence of cancer. It can be a daunting effort to compile this information to educate our patients. I truly appreciate all the quality resources that are available and the opportunity they provide for the lay person to take action based on sound science. Thank you! Since I live in the low impact region to the west of the Divide, but I wonder if bans in the East will drop the price of coal tar based sealant enough that it might become competitive in the West? Maybe Washington did the right thing at the right time. Asphalt changed my life. In 1998, 1200 sq ft of hot asphalt was laid on the floor of a gallery inside a large warehouse building where I had a live/work art studio, I was developing my dream business. It decimated my life, my health, & today, every day is a Bonus Day. I am an Acute Toxic Chemical Exposure surviver. It took me 5.5 years to overcome the blindness that every MD’s said would be “for the rest of your life.”….The MSDS (Material & Safety Data Sheet) said among the dangers asphalt exposure “could cause: illness, blindness, organ damage, cancer, & death.” That’s why in California, OUTDOOR use of asphalt within 75 feet of a residence without 24 hours prior notice is illegal. Just another law that often goes un-enforced. When CA Prop 65 was passed in the last century–there were 65 substances on a list that today has over 200 substances commonly used in industry that we now know are TOXIC & so have very strict regulations–that are often ignored….